The Eloquent Woman: Famous Speech Friday: Amelia Earhart's "A Woman's Place in Science"
Famous Speech Friday: Amelia Earhart's "A Woman's Place in Science"
(Editor's note: For Women's History Month, our Friday series is focused on famous women's speeches in history.) She disappeared in 1937 and was declared dead in 1939. But pilot Amelia Earhart still captures our imaginations--even this month, U.S. Secretary of State Hillary Clinton highlighted a renewed search for Earhart's plane to be done this year. This speech was a radio broadcast speech given in 1935. 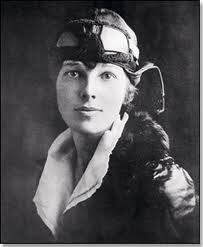 Earhart, by this time, had already undertaken a grueling lecture tour after she became the first woman to fly solo across the Atlantic Ocean in 1928; eventually, Earhart became a seasoned public speaker as part of several promotional campaigns following her record-breaking flights. Profound and stirring as have been accomplishments in the remoter fields of pure research, it is in the home that the applications of scientific achievement have perhaps been most far-reaching, and it is through changing conditions there that women have become the greatest beneficiaries in the modern scheme....Although women as yet have not taken full advantage of its use and benefits, air travel is available to them as to men. As so often happens in introducing the new or changing the old, public acceptance depends peculiarly upon women's friendly attitude. In aviation, they are arbiters of whether or not their families shall fly, and as such, are a potent influence. And lastly, there is a place within the industry itself, for women who work. Pioneers can play a special role in recruiting audiences: Being a first at what you do best confers the chance for you to rally new recruits to join you. At this point in her career, Earhart had joined the faculty of Purdue University as a visiting faculty member with a focus on encouraging women to embark on careers in aviation, and this speech fits right into that mission as role-model and career coach. Use contrast to shape your message: Throughout the speech, Earhart acknowledges the image of science and aviation as mechanistic, distant and mysterious, then counters with descriptors like "dramatic," "romantic" and "beauty," speaking with personal passion to draw the contrasts. Those word choices create pockets of surprise in the speech that keep listeners' attention--and are part of her attempt to persuade the listeners about an admittedly novel idea. Share your sense of wonder with the audience: Whenever scientists and lovers of science share their passions, excitement and even gee-whiz wonderment about the field, they're connecting with non-scientists in the audience effectively, on several levels. Your excitement (or disappointment or curiosity) on display will be infectious and establishes emotions to which your audience can relate, even if the scientific concepts stymie them. Here, Earhart takes the time to describe the advances of science--both at home and in flight--that make what had so recently seemed impossible a reality. If it seems familiar today, it was fresh then. My post on "How Rush Limbaugh is helping me celebrate Women's History Month" is nominated as one of BlogHer's "Voices of the Year 2012." Follow this link to vote--and thanks for supporting this post.